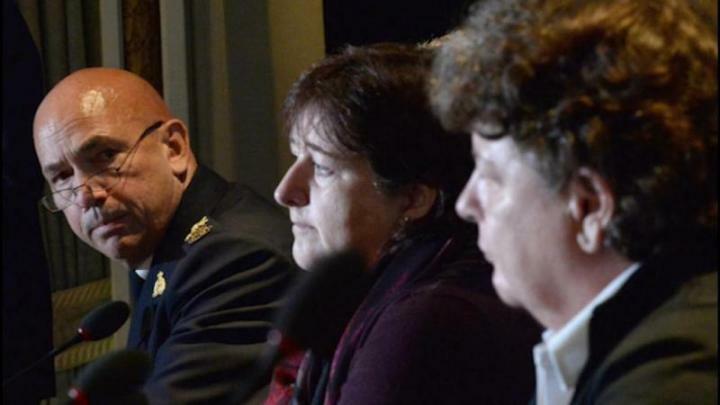 OTTAWA â€” RCMP Commissioner Bob Paulson has delivered an abject apology to hundreds of current and former female officers and employees who were subjected to bullying, discrimination and harassment dating back as long as four decades. Paulson made the historic apology Thursday as he announced the settlement of two class-action lawsuits stemming from harassment that has cast a dark pall over the storied police force. “To all the women, I stand humbly before you today and solemnly offer our sincere apology,” an emotional Paulson told a news conference in Ottawa. Paulson said the settlement would provide financial compensation for the women and lead to resolution of potential class-action lawsuits brought forward by former RCMP members Janet Merlo and Linda Gillis Davidson. The federal government has earmarked $100 million for payouts, but there is no cap on the overall compensation that could be awarded. The settlement is expected to cover hundreds of women who served in the national police force from Sept. 16, 1974, when the first female officers were sworn in, to the present day. It also includes creation of a scholarship in honour of the RCMP’s first female regular members as well as establishment of national and divisional advisory committees on gender, sexual orientation, harassment, equity and inclusivity. The national committee will issue a public annual report. Paulson was joined at the news conference by Merlo and Davidson, as well as Public Safety Minister Ralph Goodale and Labour Minister MaryAnn Mihychuk. “The impact this has had on those who have experienced this shameful conduct cannot â€” must not â€” be solely understood as an adverse workplace condition for which they must be compensated,” Paulson said. Merlo took the podium after Paulson was finished, calling it “a great day for the RCMP” and thanking the commissioner on behalf of the other female members represented in the lawsuits. She then embraced Paulson, who wiped tears from his eyes. “I love my flag, I love my country and I loved my job â€” I left way too early,” added Davidson, who also extended her thanks to the commissioner. The settlement likely marks the beginning of the end of a difficult episode in the force’s history, one that has haunted Paulson’s tenure as commissioner. Though neither of the two class actions has been certified, the settlement agreement will be submitted to the Federal Court for approval. Former Supreme Court justice Michel Bastarache will independently review claims and supporting evidence in confidence and determine which of six levels of compensation apply. Bastarache will personally interview those who make serious claims of mistreatment. The former judge will make payments directly to the women from funds transferred to his control. His decisions cannot be appealed by the RCMP or the recipients. Merlo, whose proposed class-action suit was filed in British Columbia four years ago, has spoken of many instances of sexual harassment that left her with post-traumatic stress disorder. Davidson has told of unwanted sexual advances and repeated harassment during her 27-year career, which included a stint with the prime minister’s protective detail. Her lawsuit was filed last year in Ontario Superior Court. The RCMP has streamlined its internal processes for addressing conflict, giving supervisors more power to deal with disputes promptly, but some critics fear that has opened the door to abuses. Goodale has already asked the RCMP watchdog to revisit the broad issue of bullying and harassment within the force. The Civilian Review and Complaints Commission for the RCMP is looking at whether recommendations it made three years ago have been implemented.